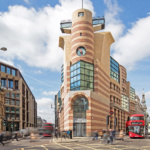 Co-working company WeWork has added London’s iconic Number One Poultry to its growing roster of historically significant buildings, and will reportedly convert all 110,000-square feet of the postmodern landmark into creative office space. 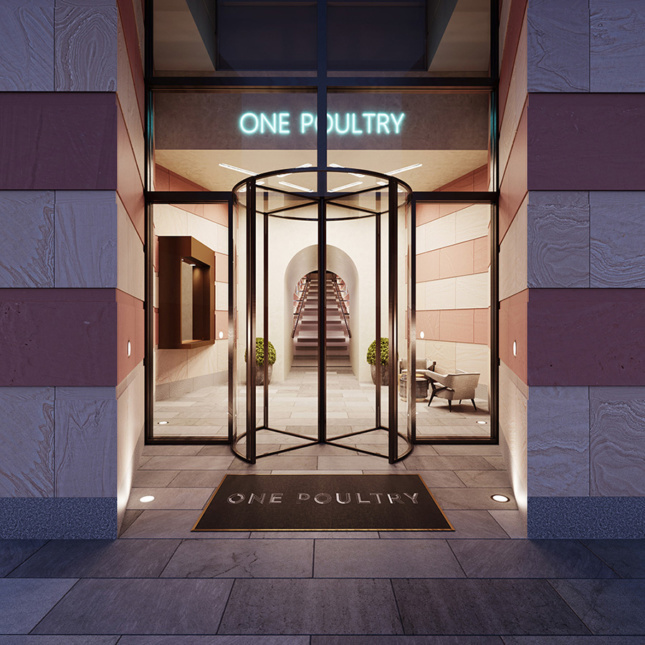 Clad in alternating bands of pink and yellow limestone and most recognizable for its periscope-shaped tower above the main entrance, One Poultry has been a distinctive part of London’s urban fabric since its completion in 1997. 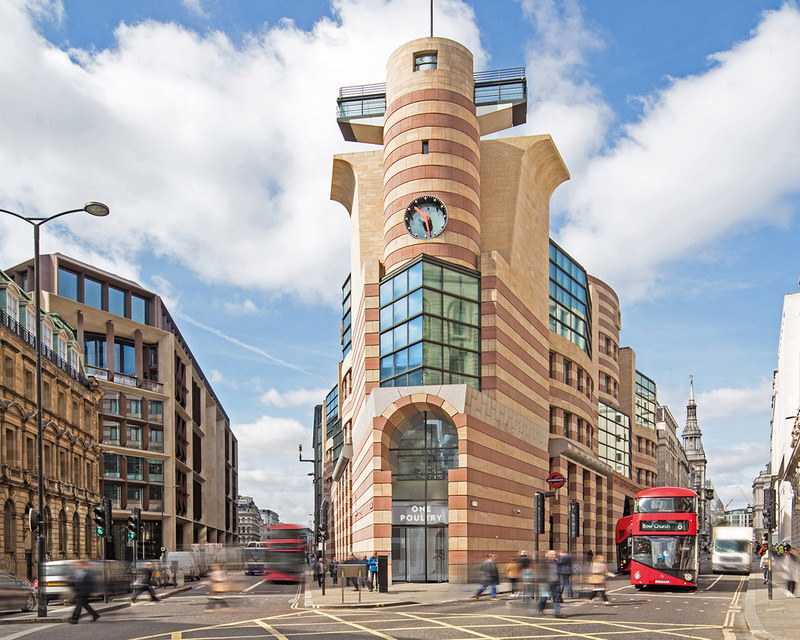 Completed five years after the death of its architect, James Stirling, the building has gone from being an object of public scorn to being designated as a historical structure worthy of preservation. 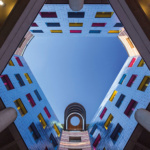 Earlier this year the building became the youngest ever to win Grade II* historical preservation status, even as the Financial Times reports that it was “voted as the fifth-worst building in London by Time Out in 2005.” The site itself has a contentious history, as Stirling’s playful scheme famously beat out a modernist tower proposed by Mies van der Rohe after public opposition scuttled Rohe’s 18-story glass and bronze building. One Poultry is currently undergoing an interior and lobby renovation by London-based BuckleyGrayYeoman Architects in an attempt to attract new tenants. 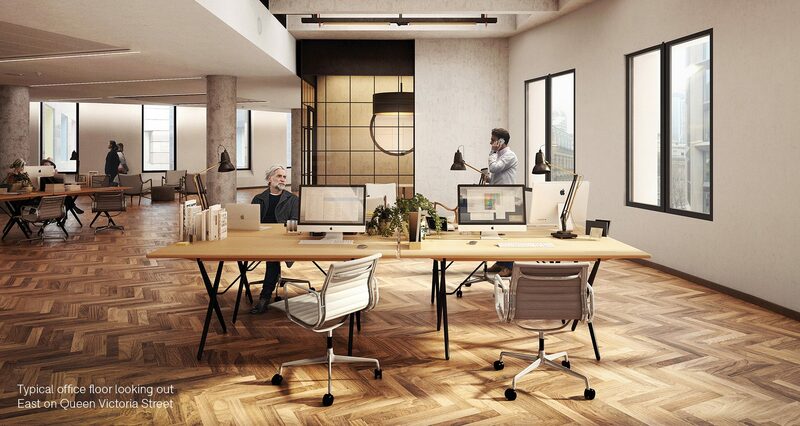 The re-situated office space seems like a natural fit for WeWork, as BuckleyGrayYeoman has managed to fit a more conventional design into Stirling’s bulging and unequal volumes by opening up the floors and exposing the concrete columns and trusses. 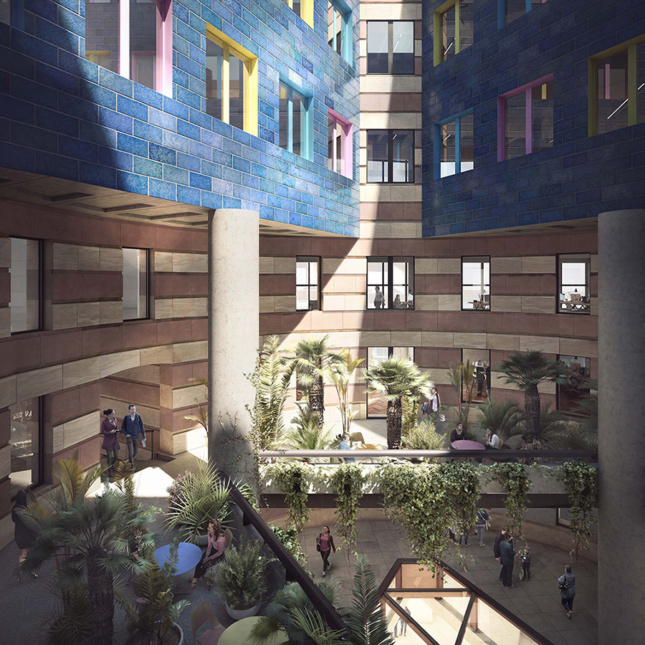 The new plan also calls for an underground bicycle storage center, a new 4,000-square foot double-height lobby, a reception area, and a locker room. 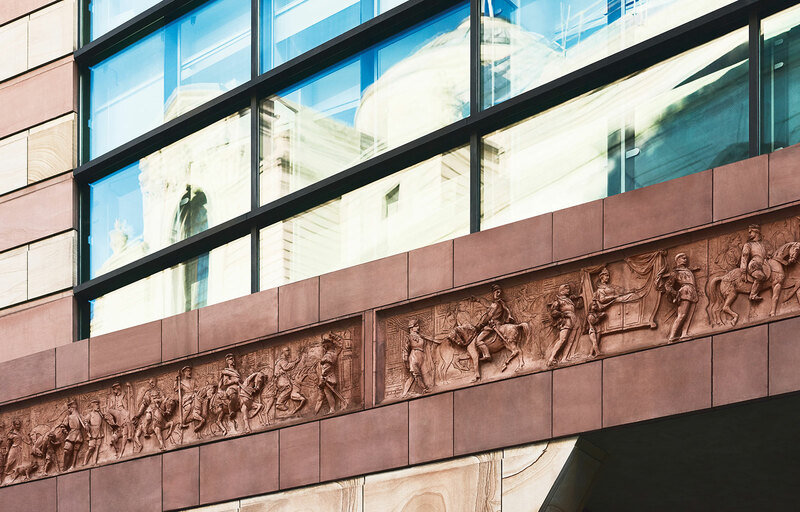 A grand staircase that had been closed off will also be reopened as a separate entrance for private members. 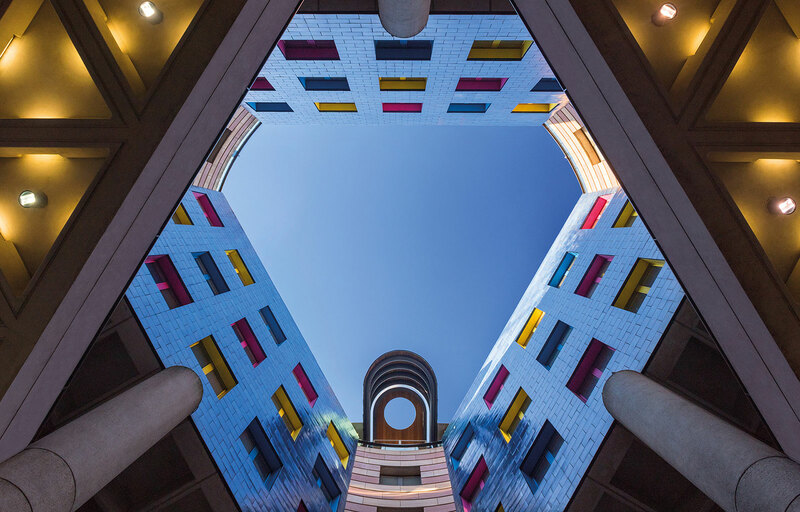 WeWork has been on an aggressive expansion lately in both the architectural and business worlds. Earlier this month it was revealed that the company had launched WeGrow, an education-based offshoot, and had hired the Bjarke Ingels Group (BIG) to design their flagship school. This week alone has seen WeWork readying itself for a foray into retail, as well as a $32 million investment in the women-only co-working group Wing. 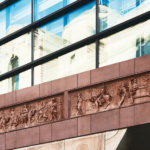 As the company continues to grow, it will be worth keeping an eye on what other notable buildings it acquires in the future.